The link-road of much-talked-about Padma Bridge will be built with Bashundhara Cement, country’s no-1 brand cement. 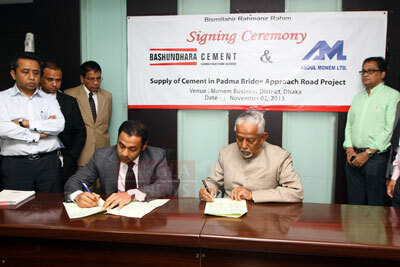 Abdul Monem Limited will construct the link-road and Bashundhara Industrial Complex will work with them as a partner. In this regard, a deal was signed between Bashundhara Group, a leading business conglomerate of the country, and Abdul Monem Limited, at its head office at Karwanbazar in the capital on Thursday. Managing Director of Bashundhara Group Sayem Sobhan and Abdul Monem Limited Managing Director Abdul Monem singed in the agreement on behalf of their respective organization. According to the deal, Bashundhara Industrial Complex will provide cement from the next week. Around 1.5 lakh tonnes cement will be provided during the construction of the link road. Abdul Monem Limited signed the deal with Bashundhara Industrial Complex as Bashundhara Cement is produced by the country’s latest and largest VRM technology. Abdul Monem Limited Deputy Managing Director Mainuddin Monem and Mohiuddin Monem, Bashundhara Group Advisor (Press and Media) M Abu Tayeb, Chief Marketing Promotional Officer Siful Islam Helali, Bashundhara Cement General Manager (Sales and Marketing Department) Khandaker Kingshuk Hossain, Bashundhara Group Head of Department (Brand and Marketing) SM Jasim Uddin, Moniruzzaman, of Corporate Sales Department, Brand Manager Shamim Al Mamun and Technical Manager Sharat Kumar Barua were among others present in the signing ceremony. On November 12, Prime Minister Sheikh Hasina will inaugurate the construction works of link-road of the much-awaited Padma Bridge.